We start teaching kids about jobs and professions at an early age. By elementary school, they know what doctors, scientists, farmers and firefighters do. In some cases, there are supporting programs to help kids gain knowledge and hands-on experience needed for those careers and to put them in touch with those who work in the field. That's not always the case when it comes to entrepreneurship, even though the skills necessary to build and run one's own company can be relevant to anyone: financial literacy, responsibility, problem-solving, creative thinking, collaboration and independence. Add to that list "technical skills," and we have not just an outline for a curriculum for career-readiness, but also the building blocks for what has become -- and will probably become more so -- a crucial driving force for economic growth in the country. So how do you explain "entrepreneurship" to kids? How do you explain business models, business plans, and basic economics? Lull Mengesha argues that many elementary school-age kids already have an understanding of bartering, and that's where he starts the first book in his series "Building an Entrepreneur." 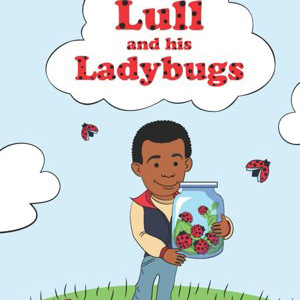 Lull and His Ladybugs is based off of Mengesha's own experiences growing up and developing his own business sensibilities. Born in Khartoum, Sudan, Mengesha came to the U.S. as an infant and grew up in a low-income neighborhood outside of San Diego. He was bussed into a school in a different part of town, where he and his friends would stare at their school-provided meals and wish they had the sack lunches -- full of snack-cakes and juice-boxes and chips -- their wealthier classmates would bring to school. Lull and the Ladybugs describes how young Mengesha comes up with a way to get one of these coveted sack lunches, which his mom tells him she can't afford. Since he can't buy the contents of a sack lunch, Mengesha realizes he can try trading. In doing so, he taps into the bartering culture young students are already familiar with (in his case, trading Silly Bands). But what does a poor kid have to offer a wealthier one? Mengesha comes up with the innovative idea to catch ladybugs in jars, as well as a clever way to "pitch" the proposed trade to the other kids in the cafeteria. Mengesha has shared this story in his talks with students, and says he's noticed that it creates valuable discussion centered around economics, entrepreneurship and culture. Mengesha also the wrote the book The Only Black Student about his experiences at a "PWI" (predominantly white institution), which has been frequently assigned in college classrooms to discuss race, academics, and achievement. But Lull and the Ladybugs is aimed at the 6 to 8 year age range, a recognition that the message about building one's own future needs to start far earlier than college. "I worked with several elementary classes and the biggest challenge was explaining what an entrepreneur is," says Mengesha. "However kids intuitively understand bartering the first day they hit the cafeteria trying to trade up for more awesome snacks. Instead of trying to teach terminology I became more focused on teaching the experiences and lessons of an entrepreneur." Mengesha plans on writing a whole series of "Building an Entrepreneur" books to teach lessons to kids "as early and as intuitively as possible." He also wants to focus on students who culturally and economically don't necessarily come from a business-oriented or an economically privileged background. Although Mengesha himself now has a Bachelors degree in economics, a Masters in Information Management, and a job at Boeing, he is himself a serial entrepreneur. That's evident in his book-publishing work (all his books are self-published), his plans to develop educational curriculum around entrepreneurship, as well as several other projects he's involved in. "If you talk to any successful entrepreneur, they usually have a history of entrepreneurship starting at an early age involving available goods or services" -- selling lemonade, for example, or mowing lawns, Mengesha says. Sometimes students are punished for this sort of thing when it happens on school grounds. So how can we encourage students to explore their own entrepreneurial ideas (not those necessarily imposed or dictated by schools or that only feed the school coffers)? How can we create a space for students to explore and grow their business acumen? If indeed these skills about building a business are crucial -- for students' future as for the country's economy -- how can we better support them in and out of school? The story of Lull's ladybugs suggests that students are already thinking about these endeavors. How can we build on that?